I was reminded of baking a cake for Mother's day by my friend Manju who blogs at Manju's Eating Delights when she posted the stunning cupcakes she made for a bake sale. There was plenty of chocolate in my pantry and I thought to bake a chocolate based cake on Sunday, since there was church on Saturday. My cake baking plans occur spontaneously, they are not well planned and executed. Thinking that I have a full day of Saturday to determine what to bake I went back to my daily routine on Friday. Went to grocery shopping after work, picked up kids. While I was driving back home, I heard some whispering behind me between Noah and Nicole. I pretended like clueless. They sneaked the gift bags into their school bags after showing each other. Finally I reached home. There comes the call from hubby, we are going to do the Mother's day party at our house on Saturday after church. We have an extended family here and the brothers decided to have the party at our house. I was in total panic, how am I going to cook for 30 people (including kids) within this short time. To my relief, there comes the sweet words from my hubby, Men are taking care of the food, you don't have to cook. Hubby ordered food from a nearby Indian restaurant and other brothers BBQ ed and brought all the necessary items for the party. Since I already had a plan to make a cake for Mother's day, I convinced hubby that it will be an easy cake to make and there was no need to buy a cake. 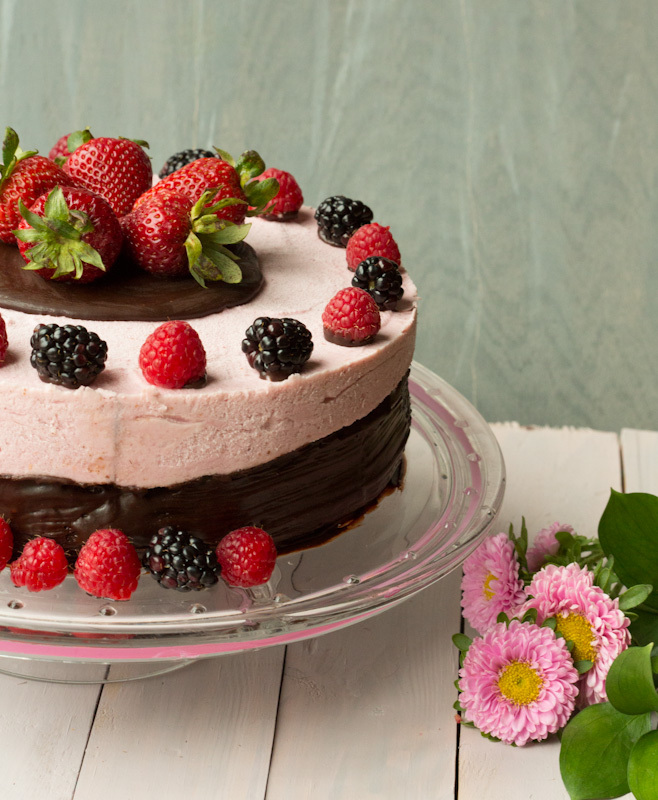 Checked my refrigerator for ingredients and came up with the Berry Mousse Chocolate cake idea. Finishing decoration was done with chocolate Ganache and some fresh berries. The cake was frozen when we cut it and tasted like ice cream cake, but the next day it tasted much better when left in the refrigerator and thawed. On Sunday I was treated with a delicious breakfast made by my hubby and kids. They woke up early in the morning to make stuffed omelet, heart shaped cut mangoes and coffee and when I woke up they were not done. So my little one escorted me back to my bed saying 'Mommy you cannot come now' with a secret smile on his face. After few minutes of wait, they all came with a tray of food with big victorious smile on their faces that claimed 'Mommy had no clue of this surprise'. I played along with a big surprise on my face. The smile I saw on their faces was the rewarding moments of motherhood. I joined them in making rest of the omelets and cutting mangoes...and we enjoyed the breakfast together. Pre heat oven to 350 degree F.
Sift together flour, salt, baking powder, baking soda, cocoa powder and keep it aside. Whip sugar, eggs, milk, vanilla and oil using a stand mixture. Gently add the dry ingredients into the wet mixture and mix with a rubber spatula. Whip it for 30 seconds. Now add 1 cup of hot water to the batter and mix for 1 minute till everything is mixed well. Bake the cake in a greased 9'' round springform pan for 45-50 minutes or till a toothpick comes out clean when tested at the center of the cake. Transfer the cake to a wire rack to cool completely. In a small bowl bloom 1 1/4 tsp of unflavored gelatin in 2 tbsp of cold water and keep it aside. Meantime you can prepare for the mousse. Puree 1 cup of berries in a blender and strain. Transfer the berry puree to a sauce pan. Add 4 tbsp of sugar and cook the berry mix till bubbles start to appear on the side of the sauce pan. Turn off the burner. Gently add the bloomed gelatin to the warm berry mix and give a good stir till gelatin completely dissolves. Keep the mix aside to cool. Whip 1 3/4 cup of whipping cream + 2 tbsp of powdered sugar using a stand mixture till soft peaks are attained. Make sure that the cream is cold before whipping. Add 3 drops of organic red food color to the berry mix and stir well. Gently fold in the berry mix into the whipped cream using a rubber spatula and mix using the spatula till uniform color is attained for the mousse. Don't over mix. Cut the bulged part of the cake (top) using a knife. You will get almost 4 cm of height for the cake after cutting the top. Transfer the cake back to the springform pan. 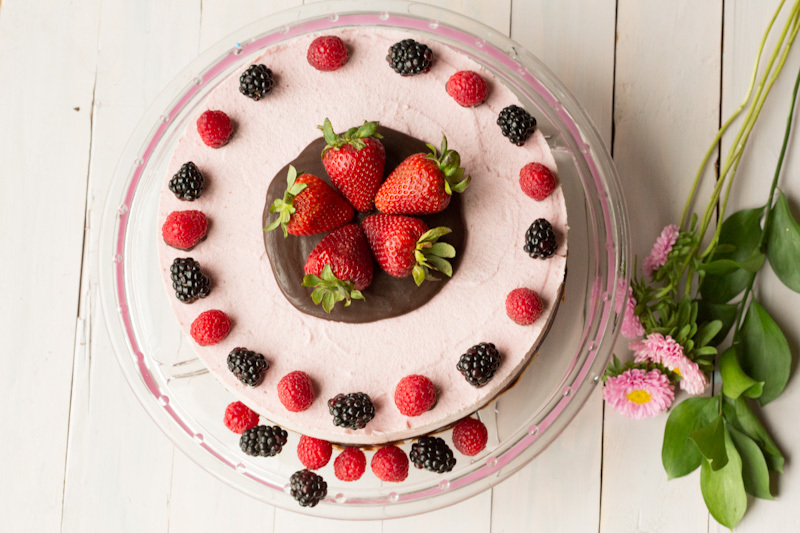 Pour the whipped berry mousse mix over the cake and level it using a cake spatula. Cover the springform pan with a plate and freeze the cake for 30 minutes to 1 hr. Heat 1/4 cup whipping cream in microwave till it starts to bubble. Pour the whipping cream over the chocolate pieces in a bowl and stir well. Add 1 tsp of oil and 1 tsp of corn syrup and mix well. Let it cool slightly. Using a pastry brush, gently apply the ganache on the bottom layer (cake layer). Make sure to brush good on sides that have even edges. The chocolate mix will be cold enough now. Pour the rest of the chocolate mix at the center of the cake. While the chocolate is still gooey, place the strawberries on it. Dip the bottom of blackberry and raspberry alternatively in the left over chocolate in the bowl and decorate the edges of the cake. Leave the cake in the refrigerator till ready to cut. I am not a fan of raspberry, but the raspberry flavor didn't over power the mousse part. You can skip the ganache part if you don't like too much of chocolate. You can decorate the cake as you desire. I just wanted to give it a fresh touch with the berries I used. Make sure that the cake is completely thawed in the refrigerator before cutting. It helps to bring out the flavor rather than the frozen cake. n ur kidsn hubby are very sweet with all the hush hush surprise and breakfast treats...very sweet! goodness!!! such an amazing looking cake... the pics are awesome... love it!!! OH MY GOD... that cake looks so stunning, drooling here. 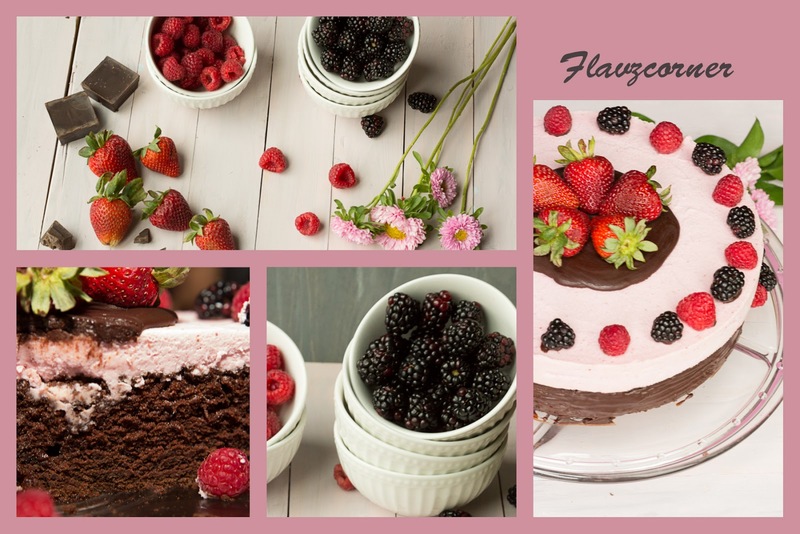 Beautiful cake Shibi... Love the berry mousse part...i love the creaminess of mousse in the cake ....loved the first click....Belated mother's day to you and glad you had a great time with friends and family! wow shobhi..u have done a grt job decorating it ,the pic looks superb too..oh my god, so u had 30 people over the weekend,i had 14 ncluding adults and kids and more than the cooking I was tired of cleaning :) entertaining so many people is not that easy !! Here motherdays is in march,weird right ? I dunno whether its just U.K who celebrate mothers day in March ! Fun post! And great looking cake. 30 people? That's a crowd! Bet you had a fun time, though. Anyway, good stuff - thanks so much. Wow Shibi, beautiful presentation. This is what u say, easy to make cake rather than buying. And on top of that these clicks and blog... You are amazing.. Hope you had a wonderful Mothers Day. Its true, their small 'surprises' keep us going. Now I have to try this recipe..
Thats what I call a cake! Beautiful and delicious! So much work! I never good with cakes, but yours looks outstanding!